Modern technology has definitely proven that you can design and build models from different materials. 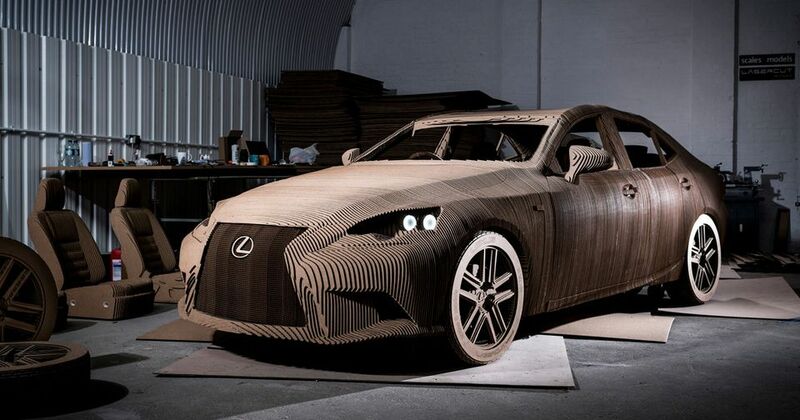 Speaking of that, Japanese car brand Lexus has reviled a life size, fully functional electric replica of its IS sedan. The main body, interior and wheels are made out of cardboard. But still, thanks to the electric motor this Origami car can be driven. Five people from Laser-cut Works and Scales and Models (London based companies) were commissioned to design and build this Origami car. They laser-cut 1,700 pieces based on the digital model of the regular car, and stuck them all together using a water-based/wood glue. It took them 3 months to put everything together. They used a 3D model of the existing IS saloon, which then they divided into principal parts, including the main body, dashboard, seats and wheels. The cardboard Origami Car will be on show as part of the Grand Designs Live event at the National Exhibition Centre (NEC) in Birmingham, UK, from 8 to 11 October 2015. Still, don’t expect to see this car on the streets. It’s still made out of a cardboard.